H.B. Charles, Jr. speaks at the 2017 9Marks conference on Leadership. 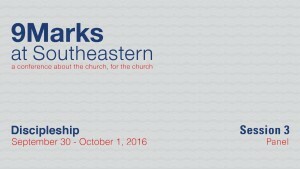 Danny Akin, President of Southeastern Seminary in Wake Forest, NC, speaks at the 2016 9Marks conference on Discipleship. Speakers gather together to discuss topics explored in Danny Akin’s sermon. Mark Vroegop, Pastor of College Park Church in Indianapolis, IN, speaks at the 2016 9Marks conference on Discipleship. Mark Dever, Pastor of Capitol Hill Baptist Church in Washington, DC, speaks at the 2016 9Marks conference on Discipleship. Trip Lee, Pastor of Cornerstone Church in Atlanta, GA, speaks at the 2016 9Marks conference on Discipleship.